Cyclist riding towards Silver Lake on the Glendale Hyperion Bridge. L.A. City analysis predicts that bike lanes are feasible as part of the planned bridge retrofit project. Photo: Sahra Sulaiman/Streetsblog L.A.
As the saga of the Glendale-Hyperion Bridge retrofit project continues, it becomes clearer that, even under the city’s car traffic growth assumptions, it will be viable to add bike lanes to the new project and to keep two sidewalks. The story thus far: In 1927 the City of Los Angeles completed the Victory Memorial Viaduct spanning the not-yet-concreted Los Angeles River. The historic bridge is, today, better known as the Glendale-Hyperion Bridge, because it facilitates the merging of Glendale Boulevard and Hyperion Avenue. Over a decade ago, funding became available for bridge retrofit projects. Glendale-Hyperion was just too lucrative for bridge consultants to pass up. The historic viaduct is technically a six-bridge complex, so it is eligible for six times more money than an ordinary bridge. In 2013, city staff and their consultants pressed for a wrongheadedly dangerously high-speed highway-scale design. Cyclists, pedestrians, and local leaders organized visible vocal opposition to the city’s proposal. What had looked like a done deal began to appear shaky. To its credit, the city responded by forming a Citizens Advisory Committee. Earlier this year, the city returned to the committee with multi-modal design options, including bike lanes, sidewalks, and crosswalks. In a recent presentation [PDF] to the advisory committee, the city showed the results of its technical studies analyzing how various potential bridge configurations can be expected to perform. The graph above shows past car traffic volumes measured on the bridge. Even according to the city’s characterization, “traffic volumes have been flat since 2001.” During this period, nationwide per capita car mileage declined. Nationwide overall total car miles driven also declined. Locally, car traffic on the Hyperion portion of the bridge, the lower green and purple lines on the above graph, also declined. But call it flat for now. These sorts of predictions generally justify widening roadways which squeezes out space for pedestrians and cyclists. The city ran its car traffic prediction models. Models based on “Level of Service,” in which the words “safety,” “walk,” and “bicycle” do not appear. LOS models keep predicting that widening freeways will reduce surface street traffic and improve air quality. Though the State of California is in the process abandoning LOS, it remains in wide use. Even with an imaginary 1 percent annual car traffic growth for the next 25 years, a 3-lane road diet option performs slightly better than all other scenarios studied, including the bridge’s current 4-lane configuration. Right now on Hyperion, there are four car lanes, two in each direction. A road diet would eliminate one southbound northbound car lane, and add bike lanes. It is not uncommon that a “road diet” lane reduction project results in overall decreased delays to drivers. Road diets can facilitate turns, and reduce conflicts and collisions; this can result in smoother car traffic flow, even without increasing speeds. What is uncommon is for traffic projection models to actually predict better driver outcomes with reduced driver lanes. A city staffer, who declined to be named for this article, suggested that the lane reduction option performing best might be analogous to meters on freeway on-ramps. The ramp meter delays individual drivers slightly, but may make the car traffic flow more regular and thus result in less overall delay. Solely on the criteria of delays to drivers, the city’s own analysis predicts that a 3-car-lane configuration will work best. SBLA is not recommending that any project should ever be studied solely with regard to driver delay, but that is what the city has done here. The overall difference is only 28 seconds peak delay; it is very little driver time when everyone arrives home safely. Will the city someday include safety predictions, too? There’s no final design consensus yet. There are still outstanding details to finalize with regard to sidewalks, crosswalks, pedestrian crossing signals, overall planned speeds, and even crash barriers. But, as it began to appear in January, and appears more certain now, two bicycle lanes and two sidewalks can and should be included in this bridge retrofit. This will be a huge victory for livability advocates, and will show that the city can engage communities to build smarter. The Glendale-Hyperion Viaduct Citizens Advisory Committee is scheduled to meet on August 7th. To follow further developments, read SBLA, the city’s project website, and posts at the Stop the Hyperion Bridge Freeway working group on Facebook. Ideally, the only consideration a cyclist should have to a route is an incline, not their safety. And taking into the account the above metrics, it makes no sense not to make this bridge an example of a forward thinking city’s ability to provide for all of it’s humans, not cars. It would be great if there to be improvements for walking and biking up the bridge going Westbound. As soon as folks leave that Glenfeliz intersection, it’s like a mad dash to the 5 or Hyperion. It was incredibly dangerous being in that middle lane so I could go back up the hill. Thanks for the update! Good to hear that there’s some traffic science to back up the road diet idea. It’s too bad that car speedometers don’t have “average speed” readouts – it might help drivers think differently about how they’re getting around. Also, I believe the cyclist in the photo is riding south (uphill), yes? Thanks, Joe. As usual, a well-written and well-interpreted overview! Rather than accommodate the supposed 1% growth in automobile travel, why not try to stop it? Why would the city take measures to accommodate more driving? How about the city try to generate increases in walking, bicycling, and transit use, instead? “A city staffer, who declined to be named for this article, suggested that the lane reduction option performing best might be analogous to meters on freeway on-ramps.” Road diets are not analogous to freeway on-ramp meters. Those on-ramps enable cars entering to accelerate appropriately to meet the reigning freeway speed. A road diet that makes 2 lanes in one direction get reduced to 1 does nothing of the sort. It causes extreme congestion and pushes motor vehicles onto nearby roads. The Second Street tunnel and Rowena have become major bottlenecks and road rage has certainly not declined. I’m also not advocating a limitless number of lanes — more than 3 lanes in one direction causes lateral traffic issues. What is needed is tougher licensing exams (e.g., slow traffic + cyclists keep right), better traffic enforcement (make sure the LAPD know traffic rules and act as role models), smoother roads (particularly make the curb lanes more driveable) and better signage. Our public officials also need to step up to the plate and realize that they can’t solve poorly designed roads with adding bike lanes and saying they’re saving the planet. Make transportation better for motorists, pedestrians and cyclists. What may sound right for young urban singles and couples without dependents is not right for everyone. Seniors and the handicapped use cars because they are the fastest and most convenient method of getting from A to B, particularly when the trips are long and would require multiple transfers. Accessibility laws were created to ensure that society does not discriminate. As 50-year old parent whose family bikes on this bridge, I don’t fit your young/single stereotype. What frustrates me most is that you’re implying that cars are the only mode that is “right for everyone.” There are youth who can’t drive, elderly and handicapped who can’t drive… If we’re really about “everyone” we need an inclusive design that gives space to everyone. If we’re serious about “everyone” we need a balanced approach that includes cars, peds, bikes, transit. I’m sure you mean well but the automobile is the least accessible mode of travel there is. To drive one must be of a certain age, have a certain amount of money, and be physically able to drive. A lot of poor families do not have the economic means to drive, or they do so at a financial burden. Families in Portland, The Netherlands, Denmark, San Francisco seem to be able to get around by bicycle. Why not in Los Angeles? To echo Joe’s comment: If the bridge is to be accessible to EVERYONE, then it must be safe for everyone, including those who walk, ride bicycles, and take transit. Lastly, it’s not an all or nothing proposition. Reducing the number of lanes does not mean that people need to stop driving. Those who need to drive, will continue to do so. The only difference is that they may move slower during rush hour, which is a small sacrifice if it means the bridge becomes safer and more accessible to all modes of travel. I’m all for a balanced approach but we’ve got to get rid of this mentality of penalizing motorists — poor city planning and lack of money spent on infrastructure has neglected all forms of transit in this city. As a motorist, I am lucky if 1 in 3 traffic lights I encounter are not red, the city needs to better prioritize through-roads (as they do in Europe), and there need to be fewer but better (cloverleaf-shaped) highway intersections around the city. Second, as a pedestrian, I get along better with motor vehicles than I do with most cyclists. Although the level of driving in California is abysmal, I find cars to be rather easy to anticipate. In contrast, LA cyclists tend to be rather erratic, sometimes riding in the inside lane, sometimes the curb lane, sometimes stopping at the stop sign at the bottom of the hill, etc.. I own a bike and ride it every now and then and I used to live in Holland and elsewhere where the topography is flat and cycling is more widespread but I’ve gotten tired of thinking America can be made into Europe. Those are homogeneous countries with relatively high levels of education — the Dutch and the Danes are better at English grammar than most LAUSD students, they’re relatively urban, they’re extremely flat, and they’ve got a grocery, bank, and pharmacy on every fourth street. I used to be more of a bike advocate but I’ve realized that even though the level of car ownership has plateaued, the traffic flow in this city is certainly nowhere near the level it should be at. I’ve also been committed to use LA transit over the past month and have been terribly disappointed with the punctuality and reliability, surprising considering how many billions are thrown at the Metro each year to subsidize the discounted fares (in Europe they charge 4-5 times as much and a friend less than 1 hour outside London pays $800/month for her monthly commuter rail pass). I’m glad that after about a decade they finally fixed the curb lane on Wilshire only to make it a bus-only lane — the damage to my car from that street alone forced me to invest in new shocks and struts — why wasn’t that lane fixed before it was bus-only? My conclusion is that public employees do a poor job at transit in this area so I’d rather have have the roads be improved and left to the private citizens to use. A delay of 28 seconds at peak times is not “extreme congestion.” And the time needed to detour to nearby roads (i.e., Glendale) would wipe out the few seconds saved by avoiding the (minimal) added delay on Hyperion. There simply aren’t that many routes that provide the same connections as Hyperion does. I can’t speak to Rowena, but my experience with the Second Street tunnel is that the congestion that happened in the initial weeks after the implementation of the road diet has largely dissipated, and is now limited to the very busiest 30 minutes or so of the AM and PM peaks. 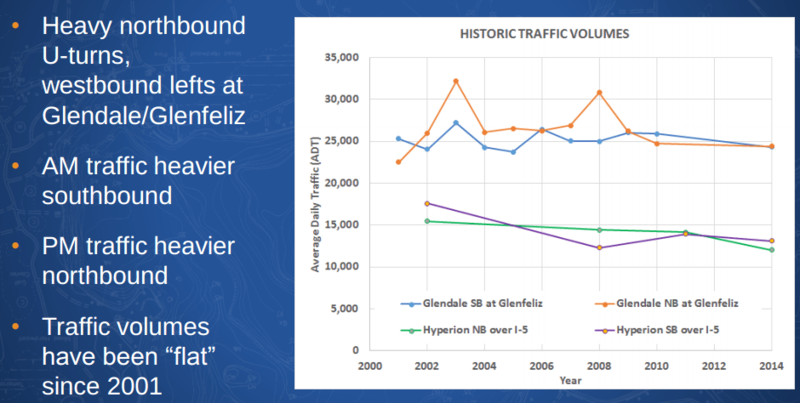 This is because unlike Hyperion, Downtown LA has many alternative routes available for drivers to use — not quiet neighborhood streets but multi-lane arterials like 1st and Temple — that eventually hook up with Glendale Blvd just as 2nd Street does. People have found these routes, and for most of the day, things work out OK. Preserving one more speedway for motor vehicle traffic simply isn’t a compelling reason to deny safe travel to bicyclists on the straightest, flattest route through downtown. For me, the occasional inconvenience of enduring a short delay or taking a different route is a worthwhile tradeoff for having a greater range of options when I don’t want to drive. Same thing with the Hyperion Bridge — I’m willing to wait 28 seconds if it means I can choose not to drive more often and feel reasonably safe doing it. It’s not about penalizing motorists; it’s about stopping our practice of penalizing everyone who happens to not be in a car. Re: red lights, there’s only so much traffic engineers can do to ensure a smooth signal progression on our arterials. There are so many major thoroughfares in LA that the timing of the signals on whichever one you happen to be driving on is necessarily going to conflict with the perpendicular ones. And the direction you’re traveling may not be the one that gets the heaviest traffic at that time of day and thus needs to have signals prioritized in its favor. Even the most sophisticated system in the USA (which is what we have) is going to have trouble when it’s tasked with managing the arterial traffic volumes we have. Which is why increasing the options available to commuters and encouraging bicycling/walking/transit is so important. what nearby roads you BUFFOOOOOON. Its a BRIDGE. There are NO near by roads. you are a BUFFOOOOON. Go move to the suburbs and work at Walmart you biddy butler you. blah blah blah go move to Hesperia. You should offer people money to read the psychic dumps you are taking in your comments. The objective fact of the matter is, a road diet on this bridge will do jack squat to car travel times. Your whole hand waving bag of emotional arguments and anecdotes belongs in a therapy session. When the infrastructure isn’t there, people behave with coping mechanisms. North American cities have seen time and again that compliance (and modeshare) goes up with better bike infrastructure. I’ve also lived in the Netherlands and I think the flatness argument is a bit overblown. Large swaths of LA are also flat. Large swaths of the Netherlands’ neighbors Belgium and Germany are also flat yet they have far lower bike modeshare because their bike infrastructure is generally not up to best practices. When I lived in Silver Lake near the reservoir and worked in Glendale I seriously looked into the bike option, but the near complete lack of bike infrastructure (including on the Hyperion Bridge) discouraged me. Yet another daily car trip that only existed because of a complete lack of other viable options. The flatness argument is not overblown, if anything it is an inconvenient truth. France, Spain, and Italy all have better weather and a younger population than Holland and Denmark yet their ridership numbers are dwarfed (and have been for over a century) by their northern neighbors. Germany is a little better but that’s because of flat university towns like Munster. Go to picturesque Nuremberg or the populous Ruhr Area and topography gets in the way. I also think few Angelenos have the luxury of living in Silverlake with the relatively short commute to Glendale. That commute sounds doable even without any new paint on the roads. great let’s take a look at the math. we are adding more people to silver lake, condo’s are adding to our population density. then let’s give less traffic lanes and pretend nothing bad happens. i live on Rowena Ave, during rush hour i am trapped in my home. it is almost impossible to leave, fire station 56 i have observed on more then ones also having a hard time leaving the station. the bike lanes has made Rowena slower when it needs to be faster and faster when things should be slower. who ever thought this was a good plan needs to see his or her therapist. a better solution is what Glendale does with their shared bike lanes. we need a higher traffic flow rate on the major streets in Silver lake, it would cut down on over flow traffic clogging side streets (i am guilty of using them because Rowena simple does not move). we need flashing cross walks to protect people crossing the streets at night and we need shared bike lanes so we can support our fellow road users as we keep traffic flow at a level that can allow people to get to where they need to go with out wasting time in traffic. We need 2 sidewalks on this bridge!! !